Cloudy skies early, followed by partial clearing. Low 38F. Winds light and variable..
Cloudy skies early, followed by partial clearing. Low 38F. Winds light and variable. 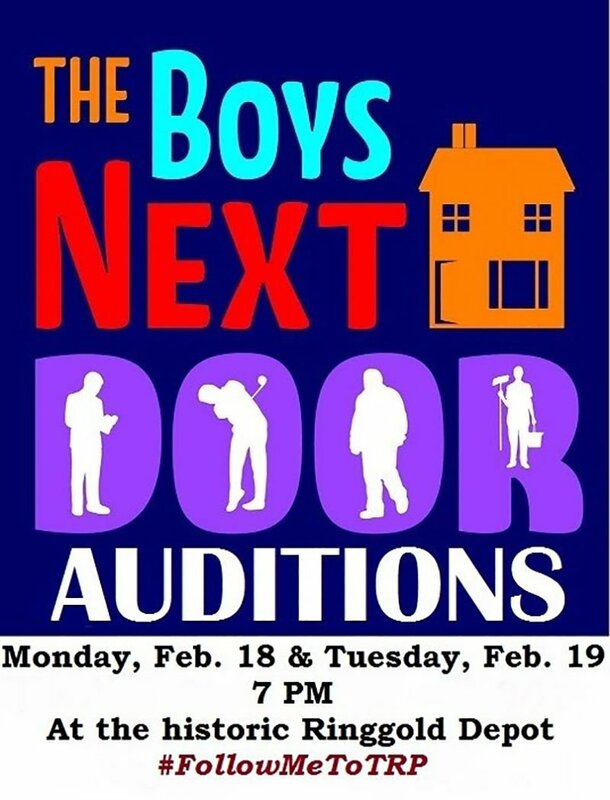 The Ringgold Playhouse (TRP) will hold open auditions for its upcoming production of the comedy “The Boys Next Door” Feb. 18 and 19 at the historic Ringgold Depot. With the company’s 2019 about to open with “The Foreigner,” TRP is ready to begin work on “The Boys Next Door,” which will hit the stage for two weekends in late April and early May. A communal residence in a New England is the setting where four mentally handicapped men live under the supervision of an earnest, but increasingly burned out young social worker named Jack. Norman, who works in a doughnut shop and is unable to resist the lure of the sweet pastries, takes great pride in the huge bundle of keys that dangles from his waist; Lucien P. Smith has the mind of a five-year-old but imagines he is able to read and comprehend the weighty books he lugs about; Arnold, the ringleader of the group, is a hyperactive, compulsive chatterer, who suffers from deep-seated insecurities and a persecution complex; while Barry, a brilliant schizophrenic who is devastated by the unfeeling rejection of his brutal father, fantasizes that he is a golf pro. Mingled with scenes from the daily lives of these four, where “little things” sometimes become momentous (and often very funny), are moments of great poignancy when, with touching effectiveness, we are reminded that the handicapped, like the rest of us, want only to love and laugh and find some meaning and purpose in the brief time that they, like their more fortunate brothers, are allotted on this Earth. ARNOLD: a mildly disabled man who works at a movie theater. He’s OCD, hyperactive and talks constantly. He gets bullied by co-workers and is afraid of fighting back. NORMAN: an overweight, middle-aged man who works at a donut shop and has trouble not eating the inventory. Love interest of Sheila. He’s oddly proud of his large ring of keys. LUCIEN: Large, mentally-disabled African-American man. Although he cannot read, he insists on checking out heavy books from the library. BARRY: A schizophrenic who believes he is a professional golfer; gets highly agitated over small things. JACK: the social working for the four handicapped men. He’s becoming increasingly burned out and is considering a new line of work. SHEILA: Norman’s girlfriend. Like Norman, she faces mental disabilities. She too is obsessed with Norman’s prized keys. MR. KLEMPER: Barry’s abusive father. MR. HODGES/MR. CORBIN/SENATOR CLARK: Mr. Hodges, Barry's golf student whose patience only goes so far; Mr. Corbin, the movie theater manager; Senator Clark, a dignified public servant. Note: the three parts are played by one actor. MRS. FREMUS/MRS. WARREN/CLARA: Mrs. Fremus, a widow who lives next door; Mrs. Warren, a new neighbor; Clara, Sheila's mentally disabled friend. Note: the three parts above are played by one actress. Production dates for the play are April 25, 26, 27, and May 2, 3 and 4. TRP encourages actors of any age, gender, race, or experience level to audition as it looks for artists to help tell this wonderfully important story. Auditions will begin at 7 p.m. each evening (Monday, Feb. 18 and Tuesday, Feb. 19) at the Ringgold Depot located at 155 Depot Street downtown.